Jeremy Likness gives an overview of what the Redux framework is, what it helps with, and how to build a web application with Redux and Angular 2. Tab Atkins’ EIC mnemonic for remembering callback arguments is fantastic. React can be used to build user interfaces (UIs) for web apps, but React developers have to provide the components to build the UI. Fortunately, there's a better way. 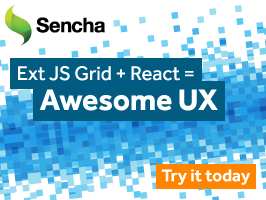 Learn how React developers can now use Sencha’s powerful Ext JS components in their React apps, using the new Ext JS Reactor. If you’re lost when it comes to building and using Web Components, Skate.js and this tutorial could help. A look at dealing with modules that need to deal with differences between environments. Todd guides you through creating some advanced Angular 2 components that rebuild Tesla’s battery range calculator, compile it AoT, and deploy it on GitHub pages. ArrayBuffers provide efficient access to and storage of binary data, but they behave in slightly different ways depending on how you access them. Learn how to perform some simple computer vision activities from Node. Currently at stage 2, it enables the dynamic loading of modules. Programmed to help team leads stay ahead of new technologies and develop themselves as managers. Still very cutting edge and experimental. Hear how the British Gas team began decomposing their app into engines. Faster, smaller, and a drop-in replacement for MustacheJS. Converts text to diagrams and flowcharts (a la Markdown). GitHub repo.